This is a teenager bedroom, she loves the pink and brown combination, we tried to added to the room evenly, with some hot pinks accents. We did the bedroom from scratch for less than $1,000.00 ** Comments welcome. Liz Claiborne quilt and shams in brown and pink colors. Hand painted MDF letters and a custom made toy chest for the end of the bed to be use as storage. Hand painted the tree mural with hanging mirrors. Also added polka-dots on the lamp shade. Used existing bookcase, added hot pink straw baskets. Custom made ladder desk with directors chair. PB Teen hot pink furry bean bag with shag rug. Purchased frame cork board added designer fabric and magnetic board. Where can I get the quilt??? I love it! Loving it. I'm going to try to paint this tree and on the limbs I'm going to put something to hold her necklaces. You did a really good job and the budget is awesome. Omg!!!!! This bedroom is amazing. I love the color combanation and I am moving soon and I what my room exactly alike and I was just wondering where you got the wall decor. It is truly amazing and I love the mirros that are hanging there as if the were actually on the tree. I love the room the only thing I would do different is make the walls a little brighter pink color not too pink because it would over power the once again amazing tree decor. OMG this room is AMAZING. my room is BrownΠnk too! 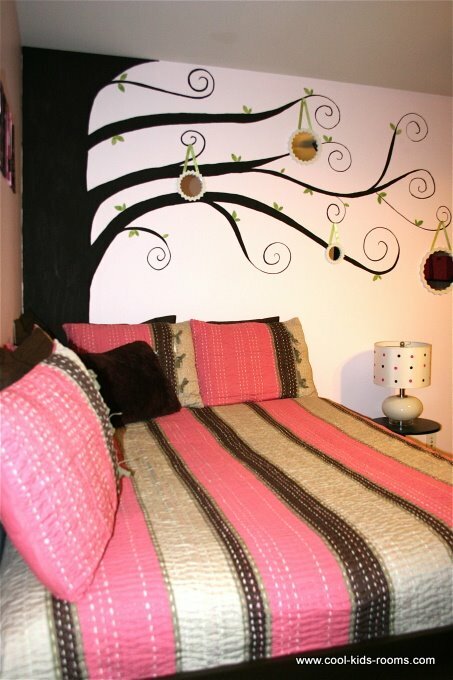 Over this Spring break, my dad is letting me redecorate my room, and I think that this is perfect! I have a smaller room, and if I could just find that quilt and other designs, I will be set! Thank you for posting this! I love it!!! I love this room! As a teenager myself, I really do love it. The colour combinations are great, and I love the painting of the tree!